TORONTO: The Toronto Maple Leafs are giving away tickets to a preseason game through a joint-promotion with Coca-Cola. The game will be played Sept. 22 against the Buffalo Sabres, and all 20,000 attendees will receive their tickets without charge. Sponsor Coca-Cola will use the event to promote its Coca-Cola Zero soft drink. Rajani Kamath, director of corporate communications for Maple Leaf Sports & Entertainment, said the promotion is all about promoting “accessibility.” The majority of Leafs seats at the Air Canada Centre are controlled by season ticket holders, making it tough for average fans and families, in particular, to score tickets. 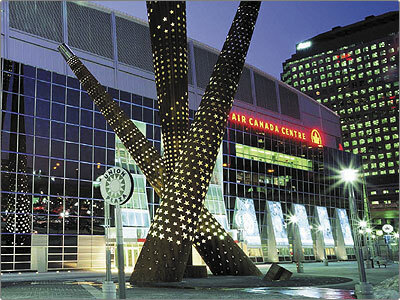 The announcement was made during a news conference at the Air Canada Centre, but it really served as an event for fans. Kamath said they started promoting the fact a big announcement would be made on July 16th, including through a video on YouTube featuring Leafs player Matt Stajan and through Leaf's online newsletter, Leafs Insider. As a result, fans (many dressed in Leafs jerseys) started lining up the night before, without knowing what, exactly, they were lining up for. Roughly 1,000 fans attended the announcement, and each received two free tickets. The Leafs and Coca-Cola will give away the rest of the tickets through “unique” promotions and contests.